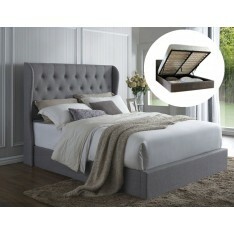 Your choice of stunning iStyle king sized beds at prices that would astonish even the court jester! Our king sized bed frame and head prices are absolutely no joke – yet people often laugh with pleased surprise or even joy when they notice them. Simply put – we offer astonishing quality at cheap prices; so where else would you look when choosing that new king sized bed for your home? In fact, if you have enough space in your main bedroom, for just a few extra dollars you could quickly upgrade from one of our superb queen or even double bed frame choices. We deliver in flat pack form, yet another way that we can drive these prices right into the floor. Of course assembly is quick and easy, with our simple instruction manuals. Take a glance at our amazing choices, offering stunning replica and European styled bed frames that would surely grace any Australian home. You’ll find classic yet modern metal finishes, as well the touch of either graceful fabric linen or amazing PU leather. You’ll find the solidly traditional right alongside the sweeping modern. Taking up that little bit more space than a standard bed, your new king sized bed frame can even offer truly valuable under the mattress storage space thanks to our so easy to operate gas lift options. If you wanted a king, but felt it would leave you too little room for storage – then, problem solved!